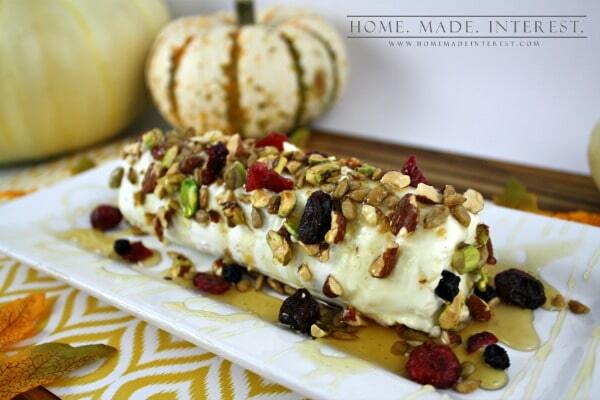 Goat Cheese Appetizer with Nuts and Honey - Home. Made. Interest. 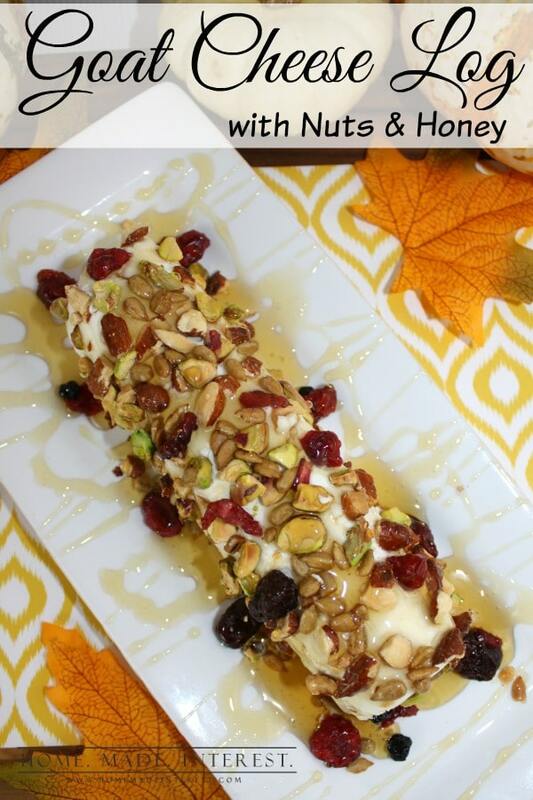 This Goat Cheese Appetizer with Nuts and Honey is a simple recipe that is the perfect combination of sweet, savory and salty. Do you like to entertain during the holidays? I love it, and that may or may not have anything to do with my addiction to serveware…really guys, I have more appetizer plates and serving platters than any one person should own, but they’re so pretty I can’t help myself! With all of those parties we tend to over indulge a little during the holidays, sugar overload is a real thing! 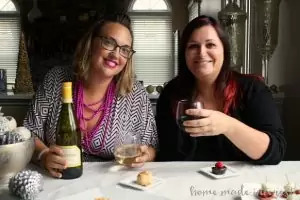 This year we put our minds to creating an appetizer recipe that would be a little lighter but still festive. 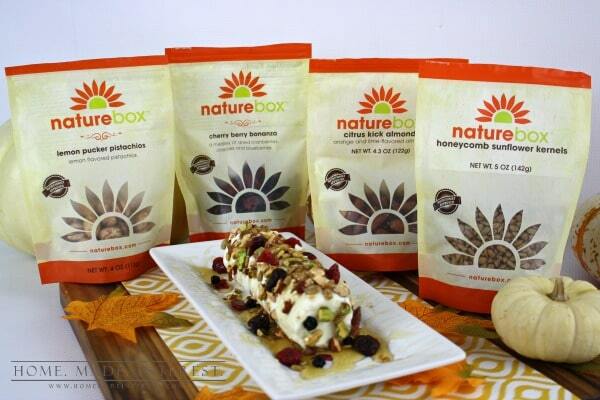 When we were offered the chance to work with NatureBox we were so excited. It was the perfect place to get healthy, all natural ingredients and their flavor combinations are delicious. If you aren’t familiar with NatureBox, they are a subscription service that delivers a box of healthy and delicious snacks to your door each month. Each snack contains wholesome ingredients – with no artificial sweeteners, flavors or colors, zero grams trans fats, and no high fructose corn syrup. You can learn more about their Product Promise here. When you join NatureBox, you’ll receive five different snacks every month. You can choose the snacks you want or be surprised with their carefully curated selections. We chose our own flavors and picked Cherry Berry Bonanza, Citrus Kick Almonds, Lemon Pucker Pistachios, and Honeycomb Sunflower Kernels (we also got Chia Seed Crackers, amazing, but not used in this recipe). For our appetizer we paired goat cheese (my favorite!!) with crushed nuts and honey. It was simple and quick, my favorite combination. 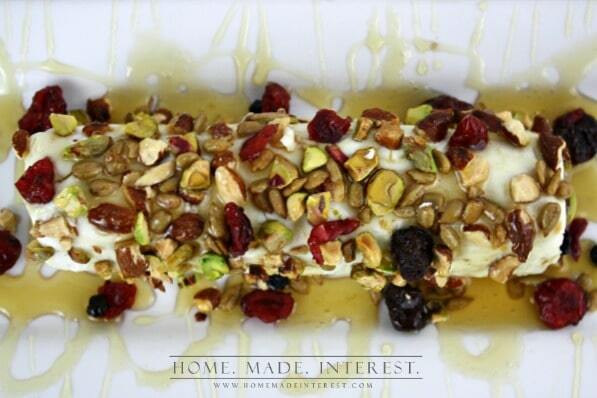 We crushed the nuts into smaller pieces and used about a 1/2 c of each nut/seed/berry to coat the goat cheese log. It’s easier than it sounds, just mix your toppings together and pour them out on a cookie sheet. Then roll the log in it. You don’t need to coat the cheese all the way around, just the top and sides. Then you can use your hands to push any loose pieces in a little more firmly, or add a few pieces in a bare spot. Once the cheese is coated just drizzle it with honey and you’re done. The goat cheese has a sharp salty flavor that goes really well with the citrus flavored nuts and the sweet dried fruit and honey. I ate it on a cracker, and all by itself, and loved it both ways. It was a nice change from the heavier, sweeter, snacks we usually have during the holidays. Whether you are serving them as is, or adding them to a recipe, NatureBox snacks are great, and NatureBox has 100+ snack options, so there is something for everyone. I highly recommend the Lemon Pucker Pistachios, yum!! NatureBox snacks are perfect for this indulgent holiday season as a better for you snacking alternative – delicious snacks for your holiday party (and options for all of the picky eaters), easy and unique additions to fall/holiday recipes and fun ways to change up the lunchbox routine. 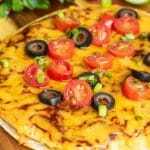 Do you have an appetizer you love making for the holidays? Sounds delicious! 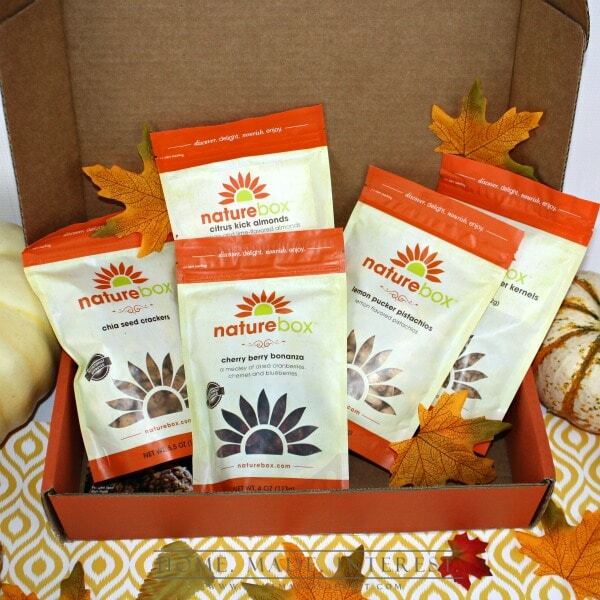 And I love the idea of a healthy snack subscription service…will have to look into NatureBox. Thanks for sharing! Yummy! 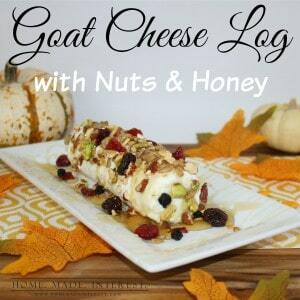 I love goat cheese, honey, nuts, and dried fruit so obviously this is a perfect combination for me. It seems so French. Oooh la la. Lol I love looking like I made something fancy when it only took me 5 min. 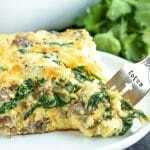 I love quick, easy and tasty appetizers and this looks like it the bill perfectly. I bet this would be the first thing that would be polished off. I am the worst when it comes to appetizers so when I see one like yours that is easy and undoubtedly tastes good, I’m all over it. Thanks for the idea. This sounds so good and simple. My kind of recipe. Pinning. Saw this on #FoodieFridays. What a wonderful idea! Pinned it! looks so delicious!!! perfect for holiday parties! OMG your recipes look so great !!!! Yum! I love goat cheese and this looks fancy but also easy to make! Oh my gosh, that looks REALLLLLLLY yummy! Wow! This is so simple! I’m pinning this to my appetizer board. 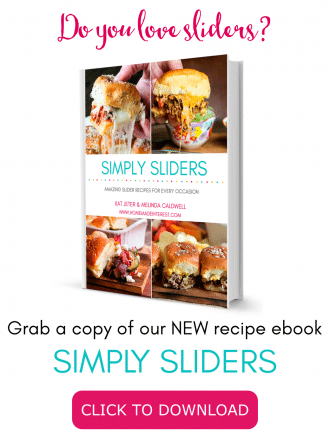 This recipes is something I really want to give a try. Will be pinning for upcoming holiday family get together. Thank you! I have been wanting to try nature box for some time now… this looks like my kind of app– easy but healthy… but yummy- thanks for sharing! This appetizer looks great and I am definitely gonna check out the Nature Box. Thanks! OH im so bringing this to my inlaws Christmas party! Thank you! This looks super yummy! I’ve never had goat cheese. But, this makes me want to try it. Try it Shantha, I always thought I wouldnt like it and one day I tried it and I was in love! I use it all the time now it is my favorite! The dried fruit and nuts look great! 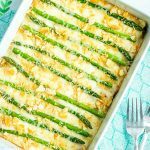 I’ve never had goat cheese before, however, this combination looks great! I’ve recently tried a honey flavored goat cheese and loved it. This sounds so much better though with all the nuts and fruit pieces. I will definitely be looking into Nature Box. I think it would be great over brie or on cream cheese too! If the taste of the goat cheese appetizer is as good as it looks…WOW. I can’t wait to taste this cheese dish. 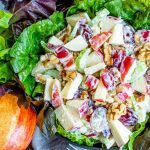 It looks very flavorful with the different colors of the nuts and fruits. Thanks for sharing. I just found you via the SITS FB page. I am totally making this for Thanksgiving! Found you at throwback Thursday. Seriously love this! Looks sooo good! Thanks Alice, it was delish! Yep, I could totally eat this! I don’t use goats cheese enough, but when I do…..yum!!! !